Onshore I saw higher quality materials being used (mastsleeve, tackstrap, cambers), which is a good thing, because I would like to use the sails for many sessions. On the water after a hour sailing it was like the old Reflex in the sweetspot, I have this feeling the sail has a touch more bottom-end. The 7.0 (last years favorite) is again feeling great, lets see if the 7.0 sail will be this years favorite again. It will definitly fun next months to test, tune everything before the summer. Lets see if the sails have again a crazy big windrange. Anyway no reason to keep my old Reflex sails (5.1-7.0), masts (400-460) and Neilpryde X9 booms (160-210 /180-230). Contact me if you're interested. Everything not sold will be return in April to the Kater shop. First session was wednesday with the ReflexII 6.2 and Futura 93, I picked the sails up at the shop and 30 minutes later on the water checking out the new performance. At first I did the "chop" test, just sailing in some unpredictable chop. 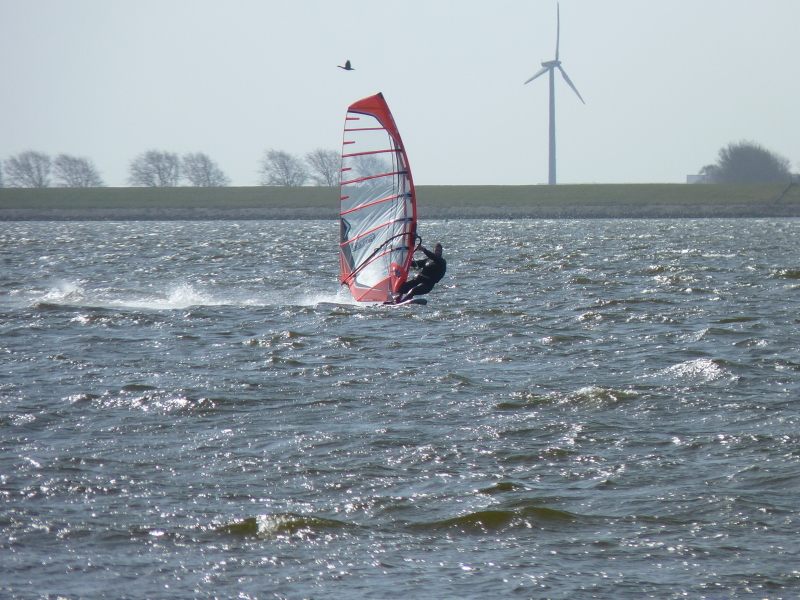 This was fun and easy, later I looked for a bit less choppy water and did a 71km/h topspeed and 69km/h run. I used basicly standard setup, only tensioned the Reflex tensioners good. The Sonntag SL-S Rev2 34cm matches quite good and is definitly not performing on flat water only, too bad the standard C3 wasn't there to test (I hear good rumors for chop). Third session was like the first one, in the sun at the Amstelmeer only a bit less wind. Now together with 3 other wadjes. First I thought it would be a 7.8 tuning day, but once there 7.0 was big enough. Basicly the same setup as 6.2, everything recommended and reflex tensioners on full tension. I started with the lately favorite combo Futura 93 + SL-S 34cm, but in the chop it was clearly the 7.0 was a bit big, no spin-outs or dangerous movements with the board but not as comfy as 6.2. However it did the best speed, soo it wasn't bad. GPS session. I think on flatter water the 7.0 will be fine for the Futura 93. Later I borrowed Gauke a SL-S Rev2 36cm for his brandnew Futura 101, it was clear he was having fun. At one point I could have a try with his sail/ setup. And it was very nice balanced over a big windrange, now the 7.0 felt perfect. Its always nice when you find this ultimate combo, which is instantly your favorite gear. At one point I had to return Gauke his equipment ;), took my iSonic 107 out of the bag with SL-P 38cm. It was a while ago, but I sooo like this board with 7.0. Mainly because in 2010 I sailed like thousands of kilometers with this combo. There is no surprise, and every unbalance is solved within the first reach. Sometimes having an easy ride which you know 100% and doesn't has to be tuned anymore is very very nice.